Secret Ballot (Raye Makhfi) concerns an earnest and idealistic young woman who comes to a provincial Iranian island to supervise an election process by travelling around and collecting votes from the peasants that she can find. The name of the island, the nature of the election, and the names characters are never identified in the film. The episodic plot takes place in a single day and consists of various encounters with local, often illiterate, peasants whom the election agent attempts to entice into voting. Since she travels about in a jeep with a reluctant soldier to guard her, the film has sometimes been described as a “road movie”, and it does have the aimless quality of such films. There are two main issues, or areas of interest, to discuss in connection with this film. One concerns what the movie is really about thematically, while the second issue concerns Payami’s distinctive film narrative style in this movie. The film is presented in something of a neo-realist and minimalist fashion, but also depicts bizarre, unrealistic situations, reminiscent of Luis Bunuel’s early films. This has led to a wide variety of critical responses. Most reviewers, and even to a certain extent Payami, himself, describe the film unambiguously as a comedy. But most certainly the film is not a comedy, at least not the way I use that term. The film does contain absurd, even surreal elements (just as Bunuel’s films do), and this surrealism can perhaps be unsettling to some viewers, establishing a distance between the viewer and what’s present, just as a joke might do. Faced with a surreal event, the viewer might feel compelled to laugh nervously at the absurdity of it all, but I contend that neither Bunuel’s films nor Secret Ballot are truly funny. Surreal art productions can tickle the imagination, they can fascinate us, but they are not “HA HA” funny. Yet I have been present at screenings of Bunuel films during which the audience was (nonsensically) screaming with laughter. Now it is somewhat dangerous to assert something of an objective standard for comedy, but I believe that most sensitive viewers would agree with me: this film is surreal, it is absurd, but it is not funny. My contention is perhaps even more controversial in view of the fact that Payami, himself, apparently thinks Secret Ballot is funny. But I wonder if Payami’s remarks on this score may have been influenced by the enthusiastic reception of Western reviewers who describe the film as a comedy. A related idea concerns the degree to which symbolism has a prominent role in the film. The surreal moments, such as the appearance of red stoplight in the middle of the dessert, are often thought to be highly symbolic, but I think that it would be a hopeless exercise to attempt to construct a detailed symbolic or allegorical framework in order to explain the meaning of the film. Those absurd, surreal constructs that appear in the film can be striking, but, like explaining a Salvador Dali painting, it’s probably unwise to pursue their collective meaning to much depth and overall coherency. 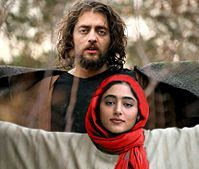 So, returning to the subject of what the film is about, what message does it have, we can identify three main topics: (a) the hopelessness of establishing a true democracy in a traditional society like Iran, (b) the confrontation between the conflicting perspectives of an educated, city-bred person (the girl) and the down-to-earth peasants in the countryside, and (c) the confrontation between an idealist (the girl) and the dead weight of traditional society that cannot accommodate that realism. To a certain extend all three themes are present, but I would lean towards the third theme as the most interesting one. If there is any narrative arc in Secret Ballot, it traces the election official’s growing awareness of and reconciliation to the practical realities of life in the traditional Iranian countryside. This is a journey of the mind, and this is where the surrealistic elements have some traction. The second issue of interest in Secret Ballot is the cinematic style of the film. Payami works in extremely long takes and long, distant camera compositions, during which the action is minimal and seemingly aimless. The film opens in longshot of a plane dropping a box by parachute at dawn and then presents a desolate beach that is guarded by two bored, uncommunicative soldiers. After eight minutes of the film, we are still only in the fourth shot of the film and still have no idea concerning where we are or what is inside the mysterious box that has fallen from the sky (it contains a ballot box, as it turns out). After twelve minutes a boat appears and drops off the young lady, and only after fifteen minutes since the beginning of the filme do we learn that she is going to supervise the local election process. Everything in long shot – what could be more distant from Kiarostami’s approach, which consists almost entirely of dialogue in medium shot composition? Yet there is something of a connection between the two, because of the slow disclosure of the narrative context and circumstances. In addition, both of them use non-professional actors, which introduces a slow awkward tempo to the acting, but also carries a certain refreshing authenticity to their interactions. Though film acting is pretty rough, as one might expect from non-professional people, the natural performance of Nassim Abdi as the election agent has a certain magnetism that helps carry the film. This is the only feature film that she has appeared in, but from this exposure it would appear that she could have a future in this medium. In general, Payemi’s slow, languid cinematic style is very much aided by the contributions of his production team. He has an absolute top cinematographer (Farzad Jadat) and excellent sound editing (Yadollah Najafi and Massimiliano Normanno) and original music (Michael Galasso). This dreamy style hypnotises the viewer into an ethnographic contemplation, not only of life in Iran, but of life on this planet in general. In fact the cinematic dreamworld that we enter into while we watch Secret Ballot is not just an intriguing feature of the film, but is in fact the key to the positive aspects of the film experience. It is almost a case of form over function, but not quite. We do not so much contemplate the situation from a mental distance, as we might with a Kiarostami film, but instead we find ourselves drawn in to that fundamentally different tempo of traditional life in this desolate region. We become so immersed in this strange bleak world and living according to its unfamiliar tempo that absurd moments and situations blend in smoothly with what is presumably normal. Ultimately, we are caught off guard when these odd moments arrive, and we are not initially aware of the distinction between the normal and the surreal. This is what gives the film its eery quality, drives the cinematic experience, and remains in our memory after the film is over. I am not really sure that Payemi deserves that much credit for this. What makes this film fascinating may perhaps be a lucky side effect of both fortuitous circumstances and the contributions of other key members of the production team, notably the cinematographer and the lead actress. Since filmmaking is a collaborative operation, and the film experience is finally dependent on the constructive perceptions of the viewer, attribution of auteurist credit is not always possible, anyway. The film exists by itself, awaiting the next viewer. Abbas Kiarostami, who was born in 1940, has since the early 1990s become one of the darlings of Western film criticism and the recipient of e xtravagant and undeserved praise. This puts me on the side of Roger Ebert and in opposition to Kiarostami’s fanatical postmodernist admirers. In order to consider any film by Kiarostami, one first has to confront his auteur status and ponder why he is so loved by the intellectual film critic elite. Certainly his directorial style is extremely minimalist – he is the Kazimir Malevich of filmmaking. Operating with a minimum of camera setups, his films mostly consist of a few extremely long single-shot takes of someone talking about his or her personal situation. The actors appear to be authentic, non-professional individuals drawn from real Iranian society and discussing their own personal circumstances. As such, watching a Kiarostami film is somewhat akin to watching a cinema verite documentary, rather than a feature film. There appears to be a flamboyantly self-conscious attempt to assert that the viewer is not being “manipulated” by traditional filmmaking narrative techniques. This may make Kiarostami attractive to postmodernist intellectuals who wish to transcend the boundaries of traditional narrative, but by eschewing most traditional film narrative, Kiarostami also abandons much of what is attractive about cinema. There are other intellectual factors that probably account for some of his popularity. The fact that he is Iranian is certainly significant, because the Western public is fascinated about how ordinary people can live in what appears to be such a restrictive society. In addition, Kiarostomai’s films, like those of other Iranian filmmakers of his generation, often feature women and issues associated with being a woman in Iran. The point is that Kiarostami’s films must be viewed from an intellectual perspective in order to be appreciated, and this can seem to be somewhat paradoxical in view of his apparent attempt at “direct” (hence, by implication, more “authentic”) filmmaking. 10 (Ten) is perhaps the quintessential Kiarostami film, because it has taken his minimalist tendencies to an extreme. It is set entirely inside an automobile and has only two camera setups: one directed towards the driver and the other directed towards the passenger in the front seat. The film comprises ten dialogues between a young nameless woman and various people, mostly other women, in her life. Thus the film is exclusively a set of medium close-ups, and this gives the film a certain spare intensity. Kiarostami, himself, was not even present when the camera shots were taken, thereby maximising his direct cinema credentials – his physical absence thereby presumably shielding him from the charge that he could manipulate (and thereby make artificial) the performances. Instead, he set his amateur actors, driver and passengers, off into the Tehran traffic with the camera running. After collecting 23 hours of footage, he selected what he wanted in order to produce a 90-minute film. The driver’s conversational partners are her approximately 10-year-old son, her sister, another woman friend, and three strangers to whom she has offered a lift: an old woman, a younger single woman, and a prostitute. All of the discussions touch on the roles and concerns that women have in Iranian life. The prostitute is not shown at all in the film; we only see the driver’s side of that conversation. Since the prostitute’s comments about her lifestyle are highly provocative for the current Iranian regime, one wonders if her invisibility was maintained in order to protect the “actress” from possible retaliation on the part of fanatics after the film was released. The initial conversation, which is the longest one, is with her son, and this one is perhaps most crucial to whatever meaning the film may have. In the conversation we learn that the parents have divorced and that the son is highly critical of his mother for leaving his father in order to build an independent life for herself. Thus the mother is established as an “independent” woman, a provocative and difficult role in Iran. But however a film may appear to abandon narrative, the film must still have an interesting narrative that can be mentally constructed by the viewer in order to be successful. 10 does have something of a slim, implicit narrative, and it is here that the film manages to appeal. The women in the film are all somewhat cut off from avenues by which they can gain fulfilment. The driver, in particular, wants to have a meaningful relationship with her son, but their continual arguments throughout the film reveal a huge gap in their views of the world: the son’s expectations of the role his mother should play are in stark contrast to her own views that people should be accepted as meaningful individuals and not just role-players. She stubbornly sticks to her principles throughout the film, but the final dialogues (with her lovelorn friend, with another woman passenger whose fiancé has abandoned her, and with her son) all exhibit failure. The final dialogue with the son has an air of finality and defeat, and the woman driver, though still determined, for the first time displays a hint of hopelessness. The narrative, such as it is, is all downhill and one of despair, not of hope. Certainly Kiarostami should rank considerably below other leading Iranian filmmakers Panahi, Merhjui, and Majidi, but there is something in his films that does seep through. If he is over-praised and probably appreciated for the wrong reasons, he must not be entirely overlooked, and 10, while less successful than his Through the Olive Trees (Zire Darakhatan Aeyton, 1994), is still worth seeing. In the next few weeks I will be posting some reviews and commentary on Iranian films that have appeared in the last few years. The focus will be on the Iranian "new wave" that has attracted attention in international circles.